The Cisco SPA5xx IP Telephone family is the next generation of small business IP phones that are perfectly suited to interoperate with Asterisk systems. This new family of phones inherits all of the features that Asterisk users loved in the Sipura > Linksys > Cisco SPA9xx family of phones. 3.If newer firmware is available, save it to disk and upgrade the SPA5xx using either the spa5xxxxx.exe file or with a local TFTP server as described here. DISCOVER messages. For example, if the network cable is disconnected. 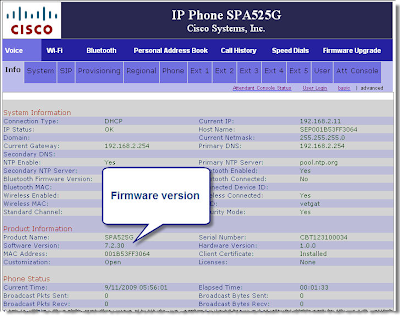 There are times when things may go wrong with the Cisco SPA5xx IP Telephone or you may need to restore the device to factory settings and start over. This guide explains how to restore the Cisco SPA5xx to factory settings. 1-Press the phone's setup key, #11 in the Phone Overview section. for example, the network cable is disconnected. 1-Extension numbers and assignments for each SPA5xx extension to be configured ,In this article, I use 151, 152 for line keys 1 and 2 of the 5 available on the SPA525G. 2. Line 1 will be display "Fred 151". 3. Line 2 will display "Sally". 4. 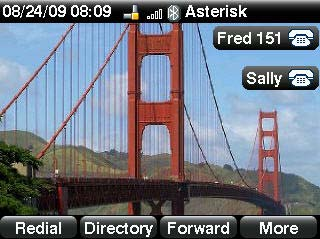 The phone will display "Asterisk" at the top-right. Once you have gathered all of the basic information, configure the Asterisk server. Edit the sip.conf and the extensions.conf file on the Asterisk server. All About VoIP Hosted PBX Services! Coup hosted PBX services are like a blessing when it comes to communication because they provide lots of benefits that help you in cutting down your monthly bills and saving money in many ways. Either the service is for a business or a household, it fits perfectly well to both of them. For businesses, it is ideal because it keeps a close check on all the calls. From a traditional phone system, it saves almost 20-50% more with the VoIP hosted PBX services. Furthermore, with VoIP hosted PBX services, you do not need to make heavy investments like buying special equipment. You can pay for different equipment and stuff that you might need whenever you want or with the growing business needs. 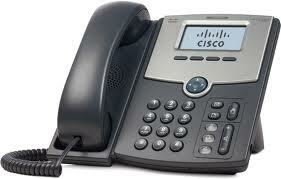 It is not a compulsion to buy special phone set to get started well with the VoIP hosted PBX services. This actually shows you how carefully the entire system is designed and how much cost effective it is. All you need for the initial start up is the basic stuff and no heavy investments and financial burdens at all. Moreover, VoIP hosted PBX services allow you to control the bills and your communication requirements anytime you wish to. If you want to cut down the calls even further or increase them it is easily possible with VoIP hosted PBX services. You can make any kind of changes as you like with this system easily unlike the old and out-dated PBX services. Something, which is even better about it is that you do not have to wait, sit or make appointments with technicians every time you need to have some changes or adjustments in your system. Rather, the entire mechanism is computerized and you can easily make the changes and modifications quickly by just making a call. This is something really good and ideal for a fast paced and hectic life these days. Many people are worried about the depreciation of the equipment and the devices under usage for such services. However,VoIP hosted PBX services let you free from all these tensions too. As you do not have to buy any heavy and important equipment for it, you are free from the depreciation stress too. Such problems only occur with the traditional PBX services but there is no space for such issues in this latest technological creation. If we take a look at various researches and studies conducted in order to know about the success of VoIP hosted PBX services, we come to know that it is one of the most successful things in telecommunication and the masses are readily adopting it. For the users, it helps in reducing costs and bringing out exceptional cost effectiveness while for the service providers it is ideal as it is more and more in demand and it creates a lot of opportunities for employees. Axvoice is one of the good providers of VoIP hosted PBX services. It not only comes up on all the points discussed above but it has developed great plans in order to meet the needs of its users at different levels. The services provided by Axvoice are efficient, reliable and highly recommended by most of the experts. Valcom device is added to the Trixbox as a standard SIP extension (generic SIP phone). 1. Navigate your web browser to the IP address of your Trixbox SIP Server. 2. Upon opening the Trixbox webpage, you will be in user mode. Select “switch” in the upper right corner. 3. Login, using the proper credentials. 5. By default, you will be taken to the “System Status” page. 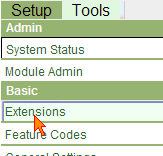 Select “Extensions” under the “Basic” group on the sidebar menu. 6. You will be taken to the “Add an Extension” page. Verify the “Device” drop-down is set for “Generic SIP Device” and click “Submit”. 8. 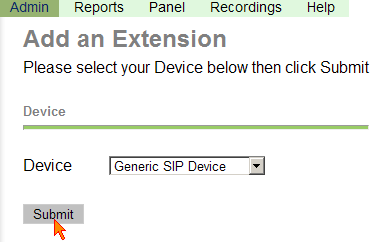 Still on the “Add SIP Extension” page, enter in your outbound caller ID string. 10. At the bottom of the “Add SIP Extension” page, click “Submit” to add the extension. 11. You will now be sent back to the “Add an Extension” page. On this page, select “Apply Configuration Changes” at the upper right corner. 12. You will now be prompted to “Apply Configuration Changes”. If you are finished creating the extension, select “Continue with reload”. If not, simply select “Cancel reload and go back to editing”. 13. After reloading the configuration, the process of adding an extension to your SIP server will be complete. 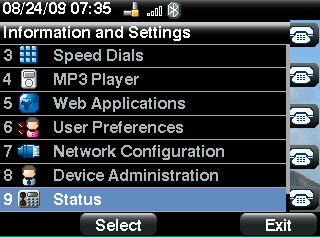 You may now add your SIP endpoint settings (“User Extension”, “secret” and SIP server IP address) to your SIP device. 14. Open the VIP-102B tool interface for the Valcom SIP enabled VIP device.